When I was a boy, I didn’t really have much to fear. I mean, sure, I had the normal 3 or 4-year-old fear of the dark, fear of skinning my knees or getting into trouble; but I, like many my age, felt secure, and able, and empowered. And that bliss lasted until I was 7 or 8 and put under the care of my older cousin for a few hours… a couple hours that seemed like days. As our parents left the house, I heard those infamous last words, “You wanna see something cool?” Knowing my cousin as I do now, I realize he wasn’t trying to inflict deep scars on my psyche; he was just being a 12-year-old boy, and being a 7-year-old boy, I absolutely wanted to see something cool. I followed him around the house, and to his room where he slid open the closet door and picked up some blankets from the floor to reveal a glorious, beat up, old, civil war era rifle. My fearless, boyish eyes had never seen anything so beautiful, and then he set it into my hands and told me, “be careful… it has a bullet in the chamber.” I was careful. In fact I was so careful that I gently placed the loaded rifle onto the bed and tried to get away, but my cousin saw my discomfort. I spent the next ‘few’ hours waiting for my family to return while running through the house to find places to escape and hide, my cousin following me to try to get me to “just touch it one more time.” Many years later, I reunited with that rifle at one of my aunt and uncle’s garage sales. It was then that I finally touched it just one more time. I clicked open that chamber and I found a wooden bullet inside and had a laugh. The Disciples had every reason to be afraid: Jesus had been yanked away from them and horrifically crucified. Certainly they were afraid of Roman and Jewish leaders; hiding behind a locked door because of the fear that they too might be dragged out and arrested, tried, beaten, tortured and crucified. On the outside they may have seemed quite calm and collected, gathering themselves to plan and strategize, but as John explains they were conflicted, grieving and fearful. Fear overcame them and they hid away. They seem to have completely forgotten the power of the resurrection that they had previously witnessed when Jesus told Lazarus, “Come Out!” And recall that before Jesus raises Lazarus, Thomas is the one who agrees to go, saying, “Let us also go, that we may die with him.” But, now that death seems to be the reality for them, Thomas expresses his fear and anger; his disbelief, stating that he will not believe unless he can see and touch. What happened to Thomas? Did his fear lead him to lose faith? What about us, aren’t we afraid too? Aren’t we afraid of not being good enough, or maybe that we’re just trying too hard to be good enough, or that no matter what we do we just don’t have what it takes. The uncertainty of this world wants us to be afraid of our neighbors, afraid of new people or new situations, afraid of the unknown or the all too common and boring, no matter how small or how large the issue, we are afraid. Just like a child who finds life inviting and enticing, but then runs from the true reality of this sometimes dark and all too broken world, we are afraid. After all, how could we rejoice in peace until we lean towards Christ to place our hands in his? How can we look forward to the day of our resurrection with Christ without first dying with him and He with us? When Thomas gets his chance to ask Jesus for proof beyond any shadow of a doubt; when Thomas demands that Jesus prove who he is and why he came, Jesus, the Anointed One, the Prince of Peace, complies with Thomas’ desire and gives him what he needs “he said to Thomas, “Put your finger here, and see my hands; and put out your hand, and place it in my side. Do not disbelieve, but believe.” Jesus tells Thomas that everything is going to be alright, Jesus is the proof, and Thomas answered him, “My Lord and my God!” In those five simple words, Thomas reveals that his heart and his mind are at rest. Thomas’ fears were calmed and he could rest because in that moment, while his fingers were outstretched rubbing across the fresh wounds of humanity in the flesh of Jesus, peace is with him. The peace and the joy that Thomas felt wasn’t just from the knowledge that Jesus rose from the dead, and it wasn’t that he and the disciples suddenly knew they had all the power and authority of God on their side. The peace and joy that made Thomas cry out, “My Lord and my God!” came from the reality that God wanted them to know him and to know that he loved them. 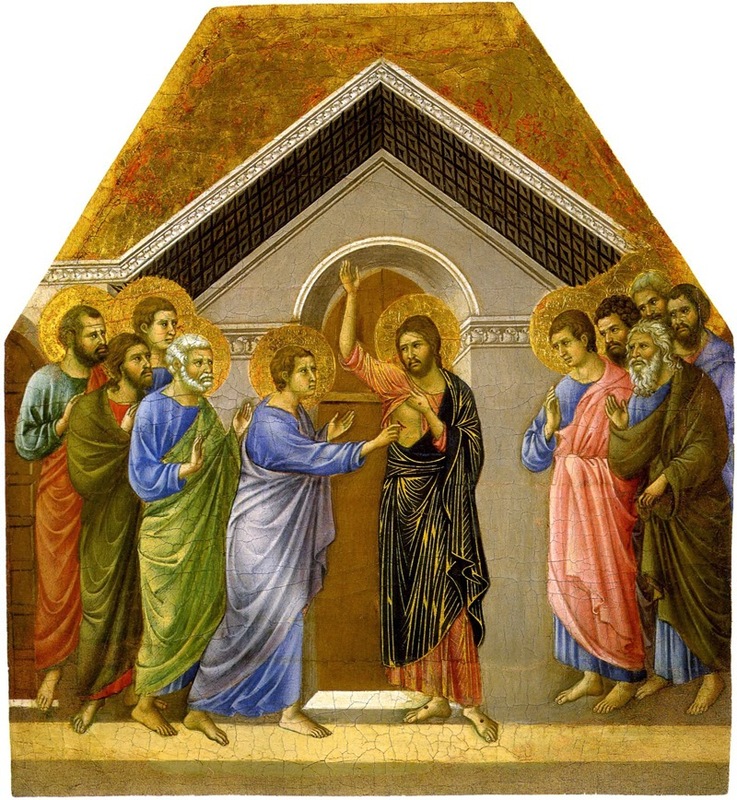 Jesus showed his side and his hands to Thomas, but expressed his desire for Thomas to believe. And Jesus expressed his desire to help us and all who believe in him, that through his resurrection sin, death and hell are vanquished and the victory given to us. Even when our fears have us thinking that we’ve closed and locked the door, boarded up the windows and turned off the lights, God can see what and where we are hiding. He penetrates those locked doors and closed off, walled up rooms that are psychological or physical. God is the one who opens our eyes and our hearts to allow the peace of The Light of the World to shine into the deepest and darkest in our lives. I don’t think we should call him doubting Thomas anymore. I think his name should be Believing Thomas. For believe he did – and confess Jesus he did. That we might believe even without seeing or touching; that Jesus is the Messiah, the Son of God, and that through believing we may have life in his name.